"We were cowards once. You and I." Subjugation is never easy for the subjugated. Those in power tend to relish that position of authority and will do what is necessary to maintain it. 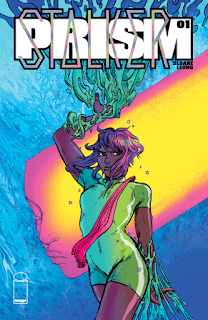 That doesn't mean that uprisings foment themselves as in Prism Stalker #1 from Image Comics. The issue is written and illustrated by Sloane Leong. There's a dose of reality in Leong's approach in Prism Stalker #1. Vep is a refugee forced to work for an alien race called the Sverans, but that doesn't mean her spirit is a slave as well. Leong focuses on very painful issues in the book through the eyes of Vep, the Sverans and some others who are similar to Vep but older. Sloane realizes that there are always different sides to a story and what's most fascinating is how even the views of both Vep and the older refugees differ somewhat drastically at points. It's these three points of a triangle of narrative that Sloane offers somewhat esoteric dialogue exchanges for moving the story along. The fact that the players in the book are alien and foreign certainly isn't lost on Leong. Her linework is ethereal and dreamlike, as all the characters seem to be floating through the action in a dreamlike way. That's not to say the characters don't have definition to them, as Leong finishes their physiques with thick lines that also show a slightly rough approach. Where the art really excels is in the colors as Leong fills the book with an abundance of pinks, purples and yellows. The color palette both underscores the notion that we're dealing with alien races here while also emboldening the dreamy nature of the action. Prism Stalker #1 is a book that lives up to the literal definition of the title. Vep is a refugee being tasked with a new lot in life (whether she likes it or not) and how she responds could have larger consequences for her and those she cares about. Leong's script is paced very well and extremely heady, but there's a lot to digest if one takes the time to do so. Her artwork is equally as powerful, giving the universe she's creating a sense of a foreign presence. Prism Stalker #1 is a fascinating first issue that aims to do a lot as a first issue. Prism Stalker #1 is available now.